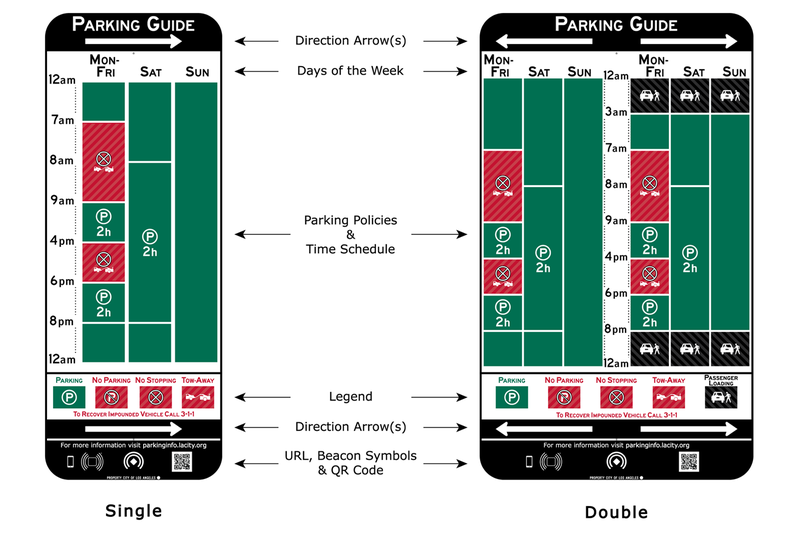 The City of Los Angeles is taking the next step toward making complex parking signs readable, simple, and understandable by conducting a six-month sign pilot program in Downtown Los Angeles featuring newly designed, easy-to-decipher parking signs. The grid-style signs are clear and innovative, laying out a 24-hour cycle where parking restrictions are clearly represented in green and red. Los Angeles is the first metropolitan city in the country to test out these revolutionary signs with the goal of decreasing parking citations due to misunderstandings created by confusing signs. Please note that these signs are only guide signs and are not enforceable. They replicate the parking restrictions of the regulatory signs posted above these signs. Indicate which side of the sign the parking restrictions apply. The days of the week that each column applies to. The times that apply to the beginning or end of a parking policy. These are the parking rules that are indicated by green, red or black. Describes the meaning of each parking policy symbol and color. Indicates there is a Bluetooth Low Energy Transmitter (BTLE) beacon attached to the sign that can transmit information to smartphones and connected vehicles when in close proximity. A quick response (QR) code, when scanned, will direct your mobile device to the parking information website. Used when parking restrictions are consistent on one or both sides of the sign. The arrow will dictate where the restrictions apply. Used when there are different parking restrictions on each side of the sign. Identify the applicable day along the top of the sign. Identify the applicable time of day along the side or center of the sign. Look across to the parking policy area and note the symbol and color. Refer to the legend if unfamiliar with the symbol or color. The new parking signs will be installed on Spring and Main Streets between 2nd and 9th Streets in Downtown Los Angeles. These signs are a pilot program so it is important for the City to get your feedback as part of the evaluation process. Please click on the link below to take a short survey and comment on the signs. We welcome your opinion. Q: How long is this pilot program? Q: When will all the signs be installed in the demonstration area? A: The signs are expected to be installed by mid-late April 2015. Q: When will the new signs be installed across the city? A: It depends on the success of the pilot program. 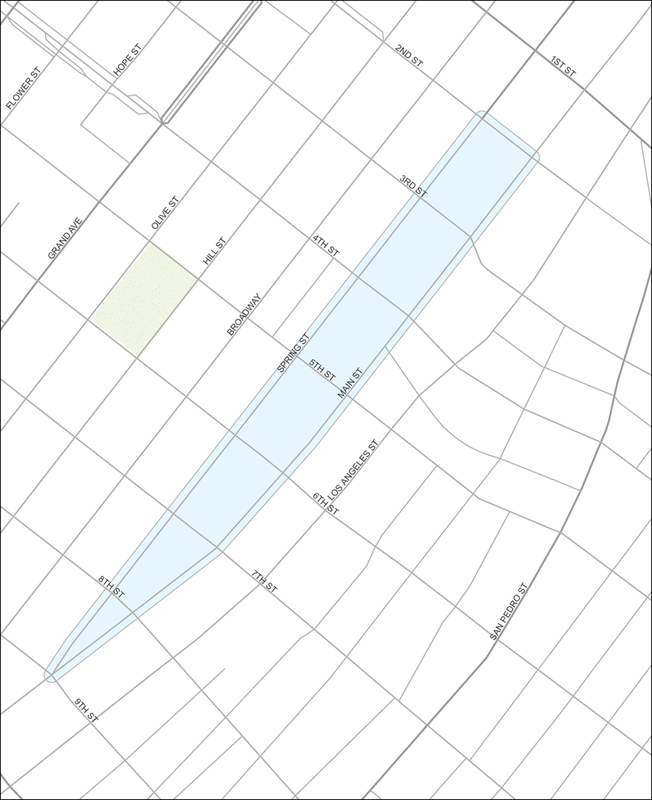 If the program is recommended for expansion, then we could see signs in other areas of the city in Fall 2015. Q: Why do we have both sets of signs, the traditional regulatory parking signs and these new ones? A: The traditional signs are approved by the State of California and the California Traffic Control Devices Committee (CTCDC) and carry regulatory authority that can be enforced by traffic officers. LADOT was granted approval by the CTCDC to experiment with the signs only in addition to the traditional signs. The second phase of our parking sign program has been awarded Innovation Fund money which will allow LADOT to seek regulatory approval for this or another sign concept. Q: Which signs should I follow, the traditional regulatory parking signs or these new ones? A: Both signs will have the same parking policies. The new guide sign is intended to present the existing parking restrictions in an easier to understand manner. Q: What is the purpose of the beacon? A: We are in the early stages of experimenting with the future digital presentation of signage. We are installing two types of Bluetooth Low Energy (BTLE) beacons on the signs as a foundation for future services to smartphones and connected vehicles. These beacons will allow app developers to create future, opt-in services to aid people in parking and even discover useful information about what's around them.